Founded in 1979 Scenic Lawns & Landscaping, Inc. has been providing quality residential landscape services and products to the many communities surrounding the historic town of Annapolis, located on the scenic Chesapeake Bay in Maryland. The company's commitment to our customers and to our craft has insured Scenic Lawns & Landscaping's success for well over three decades. With our client's needs in mind, our landscapes are designed and built to work with the existing environment to produce a beautiful, functional landscape for many years to come. We carefully work through the design and build process to insure that our customers know what their investment will achieve, and to arrive at a completed project that exceeds their expectations. A 1979 graduate of The University of Maryland with a Bachelor's degree in Soil Science, Terry has been the owner and president of Scenic Lawns & landscaping, Inc. for nearly his entire adult working life. For over 40 years he has evaluated, designed and installed innovative and creative landscape projects from small walkways and foundation plantings, to the installation of a paving stone residential driveway over a third of a mile long. Through the years his designs have been featured in Builders Magazine, Southern Living Magazine, the Baltimore Sun and recently The Evening Capitol newspaper. 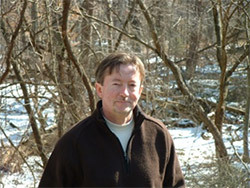 Terry's CAD (computer aided design) skills and years of experience allow him to explore and utilize the myriad choices of landscape materials available today. Eleazar Leon and Martinez Alverez have been with Scenic Lawns & Landscaping, Inc. since 2007. Both are highly skilled in landscape installation, maintenance, lawn care and landscape masonry construction. Responsibilities include pavingstone, flagstone and brick installation, wall construction, grading, sodding and plant installation.